Cracked flashing: Flashing is the thin pieces of metal installed under shingles, roof joints and roof valleys, which act as waterproofing. It usually comes with a protective coating against rust. 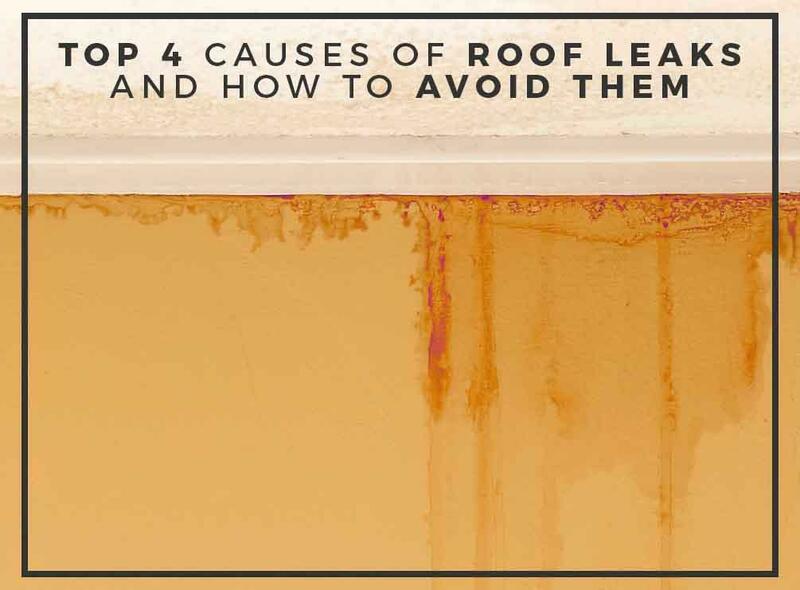 Damaged or cracked flashing can let water seep through the roof deck, resulting in leaks. Regular roof inspections (which you can do from the ground using a pair of binoculars) and timely repairs are the best way to prevent leaks caused by damaged flashing. If you see any sign of corruption, which would be visible as bare metal, contact a professional roofer for repairs. Missing or damaged shingles: Displaced or damaged shingles are easy to spot, especially on roofs with symmetrical lines like three-tab shingles. Missing or damaged shingles are normally signs of age, but can sometimes be caused by strong winds or impact from debris. If your roof is still within warranty, call for professional repairs. However, if your roof is beyond its expected lifespan, you should start planning for a new roof in the next five years. Ice dam buildup: Ice dams form at the roof’s edge when heat from the attic leaks through the roof and melts the snow, which then refreezes at the roof’s edge. Continued melting and refreezing result in ice dams spilling onto the gutters and under the roof deck, which could then leak into the attic when it thaws. You can manually clear the snow from the roof using a roof rake, but you should also make sure the attic is well-insulated. The gutter installation should be well-maintained before winter. Consider investing in gutter protection systems. Corrosion: This typically happens on metal roofs – spots where the paint is stripped down to bare metal, which makes it vulnerable to rust. Consult with your roofer before considering recoating it as doing it yourself may void the warranty, not to mention risking your own safety. To know more about preventing roof leaks or if you’re getting roof additions like a new skylight, call Tedrick’s Roofing today at 877 (212)-9355, or fill out our contact form to schedule a free, no-obligation roof inspection. We serve homeowners in Seattle, WA, and nearby areas.